The ONE thing that separates the men from the PID tuning boys. There is ONE central idea, one key concept that you should understand before tuning your first PID loop. If you DON'T use this concept, you'll probably find that your loop tuning experience will be very unpleasant and frustrating. The very first thing you need to do is understand the type of process that you are dealing with. 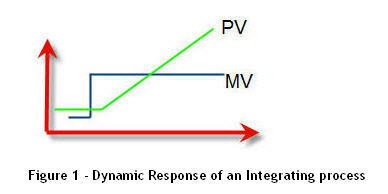 The type of process is defined by its dynamic characteristics. To work out your processes’ dynamic characteristic, step your controller setpoint and watch the process response on a trend. A critical part of tuning a PID loop is first identifying which of these 2 process types you have. I have never found a widley publicised PID tuning technique that differentiates between the two – one of the reasons that they perform so badly. You need to be using different tuning techniques - depending on the process type - so don't be tempted to skip this check! If you step your controller’s Manipulated Variable (MV) in open loop and this causes the Process Variable (PV) to start rising/falling and it keeps moving in that direction in a mostly linear fashion - your process is an integrating process. 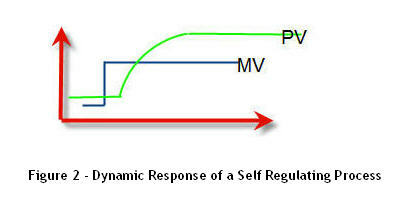 If you step your MV in open loop and this causes the PV to start rising/falling, but the gradient quickly starts to decrease until it has leveled off to flat, then you have a self regulating process. Think about what your process will do when stepped in open loop, and if you are not sure try an open loop step test by stepping your setpoint 3-5% in Manual. Be Aware: If your process is an integrating process, the step input will cause the output to rise (or fall) and keep on moving until you step the MV back down. Because of actuator hysteresis, you may have to move the MV to a value that is below where you started before the PV completely levels off. Now you know what process type you have – you can choose a tuning technique based on the specific dynamics of your process. My PID Tuning Blueprint walks you through proven tuning techniques for both Integrating and Self Regulating Processes.